Meyer was a literary toilet seat. Most of what he was exposed to was trash: 101 Knock Knock Jokes, old issues of Auto Trader, The Awesome Book of Lists for Guys. But Lenore, the bathtub knew the Classics, and she shared these stories with him. Meyer understood that. Especially when the renovation came. He was ripped from his bowl and deposited into the backyard, right on top of a broken birdbath. Things were bad in the backyard. Everyone out there was damaged and neglected. He could hear the cries of the one-eyed dolls and feel the quiet resignation of the piles of soggy magazines. Meyer tried to strike up conversation, but no one would have anything to do with him. He vowed to stay positive: "Good morning everyone. Today is going to be a beautiful day." "What do you know?" said a broom handle missing its broom, "you're just a toilet seat." Seasons passed. Rain fell on Meyer, and then snow. One day, when he could hardly remember what life had been like inside the house, Meyer began to tell himself stories. The yard filed with tales of Mr. Darcy. Of the Great Gatsby. Holden Caufield. Bilbo Baggins travelled to the Misty Mountains. Atticus Finch searched for justice, and Captain Ahab was endlessly seeking his Great White Whale. Meyer realised something amazing. Everyone was listening. All over the backyard, the piles of junk were captivated by the old toilet seat telling stories. When he stopped, someone cried: "More! More!" For the first time in a long time, Meyer was happy. 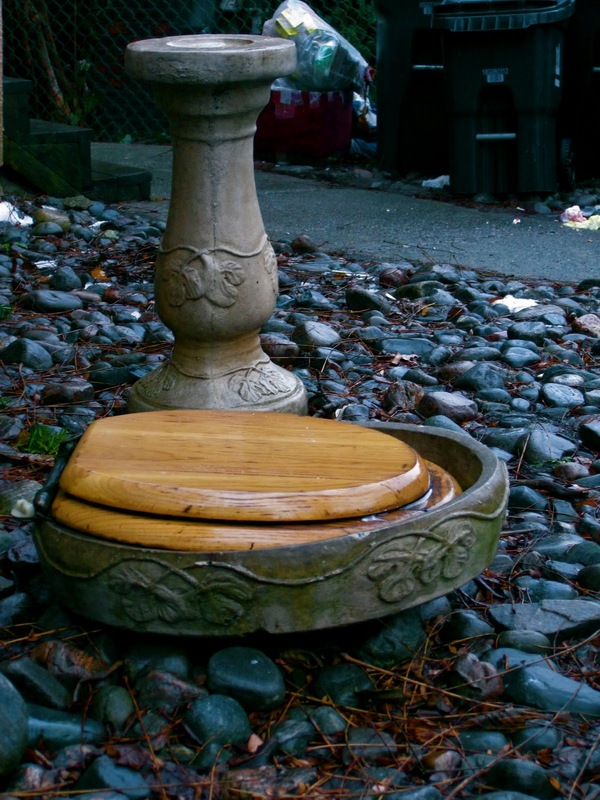 this story gives me hope...i love that a toilet seat can do that. wonderful stuff. keep em comin.